This article is about the musician and actor. For the congressional candidate, see United States House of Representatives elections in Illinois, 2010. Clemons performs in the E Street Band's Working On A Dream Tour at the 1st Mariner Arena, Baltimore, November 20, 2009. Clarence Anicholas Clemons, Jr. (January 11, 1942 – June 18, 2011), also known as The Big Man, was an American saxophonist, musician and actor. He was reported to be 6' 5" (195.5 cm) tall, hence his nickname. From 1972 until his death, he was a prominent member of Bruce Springsteen's E Street Band, playing the tenor saxophone. He also made cameo appearances in several TV series, including Diff'rent Strokes, Nash Bridges, The Simpsons, My Wife and Kids, and The Wire. Together with his television writer friend Don Reo he published his semi-fictional autobiography told in third person, Big Man: Real Life & Tall Tales, in 2009. Clemons suffered a stroke on June 12, 2011, and died of complications from it on June 18. Three years following his death, Clemons, along with the rest of the E Street Band, was posthumously inducted into the Rock and Roll Hall of Fame. Born in Norfolk County (later the city of Chesapeake), Virginia, Clemons was the son of Clarence Clemons, Sr., a fish market owner, and his wife Thelma. He was the oldest of their three children. His grandfather was a Southern Baptist preacher and, as a result, the young Clemons grew up in a very religious background listening to gospel music. When he was nine, his father gave him an alto saxophone as a Christmas present and paid for music lessons. Clemons later switched to baritone saxophone and played in a high school jazz band. His uncle also influenced his early musical development when he bought him his first King Curtis album. Curtis, and his work with The Coasters in particular, would become a major influence on Clemons and led to him switching to tenor saxophone. As a youth Clemons also showed potential as a football player, and graduated from Crestwood High School (now Crestwood Middle) before attending Maryland State College on both music and football scholarships. He played as a lineman on the same team as Art Schell and Emerson Boozer and attracted the attention of the Cleveland Browns, who offered him a trial. Clemons also tried out for the Dallas Cowboys. However, the day before, he was involved in a serious car accident which effectively ended any plans of a career in the National Football League. He would eventually be posthumously inducted into the university's Athletics Hall of Fame on February 24, 2012. At age 18, Clemons had one of his earliest studio experiences, recording sessions with Tyrone Ashley's Funky Music Machine, a band from Plainfield, New Jersey, that included Ray Davis, Eddie Hazel and Billy Bass Nelson, all of whom later played with Parliament-Funkadelic. He also performed with Daniel Petraitis, a New Jersey and Nashville legend. These sessions were eventually released in 2007, by Truth and Soul Records as Let Me Be Your Man. While at Maryland State College Clemons also joined his first band, The Vibratones, which played James Brown covers and stayed together for about four years between 1961 and 1965. While still playing with this band he moved to Somerset, New Jersey, where he worked as a counselor for emotionally disturbed children at the Jamesburg Training School for Boys between 1962 and 1970. Clemons stage front with the E Street Band, playing his famous "Jungleland" saxophone solo. Nassau Coliseum, March 10, 2008. Clemons playing his "Born to Run" saxophone solo with house lights up. Hartford Civic Center, April 24, 2009. One night we were playing in Asbury Park. I'd heard The Bruce Springsteen Band was nearby at a club called The Student Prince and on a break between sets I walked over there. On-stage, Bruce used to tell different versions of this story but I'm a Baptist, remember, so this is the truth. A rainy, windy night it was, and when I opened the door the whole thing flew off its hinges and blew away down the street. The band were on-stage, but staring at me framed in the doorway. And maybe that did make Bruce a little nervous because I just said, "I want to play with your band," and he said, "Sure, you do anything you want." The first song we did was an early version of "Spirit in the Night". Bruce and I looked at each other and didn't say anything, we just knew. We knew we were the missing links in each other's lives. He was what I'd been searching for. In one way he was just a scrawny little kid. But he was a visionary. He wanted to follow his dream. So from then on I was part of history. Well before this meeting, however, Clemons and Springsteen had moved within the same circle of musical acquaintances. Norman Seldin had managed and promoted several local bands, including The Motifs who featured Vinnie Roslin, later to play with Springsteen in Steel Mill. On April 22, 1966, Seldin had also organized a battle of the bands competition at the Matawan-Keyport Roller Drome in Matawan, New Jersey. Springsteen was among the entrants playing with his then band, The Castiles. Billy Ryan, who played lead guitar with The Joyful Noyze, also played in The Jaywalkers with Garry Tallent and Steve Van Zandt. Clemons himself had also played with Tallent in Little Melvin & The Invaders. In July 1972, Springsteen began recording his debut album Greetings from Asbury Park, N.J. and during breaks from recording, he jammed with Clemons and The Joyful Noyze on at least two occasions at The Shipbottom Lounge in Point Pleasant, New Jersey. When Springsteen then decided to use a tenor saxophone on the songs "Blinded by the Light" and "Spirit in the Night," he called Clemons. By October Springsteen was ready to tour and promote Greetings… and he put together a band featuring Clemons, Tallent, Danny Federici and Vini Lopez. Clemons played his last gig with Norman Seldin & The Joyful Noyze at the Club Plaza in Bayville, New Jersey, on October 21, 1972. Four days later Clemons made his debut with the formative E Street Band at an unadvertised, impromptu performance at The Shipbottom Lounge. Throughout the 1970s and 1980s Clemons featured prominently on Springsteen albums. On Born to Run he provided memorable saxophone solos on the title track, "Thunder Road", "She's the One", "Night", and "Jungleland" while Darkness on the Edge of Town featured notable solos on "Badlands" and "The Promised Land". The River saw Clemons feature on songs such as "The Ties That Bind", "Sherry Darling", "I Wanna Marry You", "Drive All Night" and "Independence Day" while Born in the U.S.A. saw solos on "Bobby Jean" and "I'm Goin' Down". At the end of shows, while recognizing members of the E Street Band, Springsteen referred to Clemons as "The Biggest Man You Ever Seen". 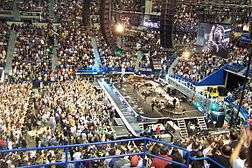 He sometimes changed this depending on where the E Street Band performs — at their 2009 concert in Glasgow he introduced Clemons as "the biggest Scotsman you've ever seen". Clemons' final recordings with Springsteen and the E Street Band were featured on Springsteen's 2012 album, Wrecking Ball, and previously unreleased material featuring Clemons also appeared on the 2014 release High Hopes. In April 2014, the E Street Band were inducted into the Rock and Roll Hall of Fame. Clemons' widow accepted on his behalf. Outside of his work with the E Street Band, Clemons recorded with many other artists and had a number of musical projects on his own. The best known of these are his 1985 vocal duet with Jackson Browne on the Top-20 hit single "You're a Friend of Mine", and his saxophone work on Aretha Franklin's 1985 Top-10 hit single "Freeway of Love". He was managed briefly in the 1980s by former Crawdaddy editor Peter Knobler, whose wedding Clemons played with his band, Clarence Clemons & the Red Bank Rockers. During the 1980s Clemons also owned a Red Bank, New Jersey, nightclub called Big Man's West. He toured in the first incarnation of Ringo Starr & The All-Starr Band in 1989, singing "You're a Friend of Mine" (dueting with Billy Preston) and an updated rap arrangement of "Quarter to Three." In the mid-1990s, he recorded a Japan-only CD release called Aja and the Big Man "Get It On" with Los Angeles singer/songwriter Aja Kim. At this time he also recorded an instrumental record with Alan Niven producing, 'Peacemaker'. In the 2000s, Clemons along with producer Narada Michael Walden, put together a group called The Temple of Soul, releasing a single called "Anna". He also recorded with philanthropic teen band Creation. Clemons collaborated with Lady Gaga on the songs "Hair" and "The Edge of Glory" from her album Born This Way, providing a saxophone track and solo. Clemons occasionally sat in with the Grateful Dead and as recently as April 2011, sat in on several tunes with the Grateful Dead "spinoff" band Furthur during a concert in Boca Raton Florida. Just days before he suffered a major stroke, he shot a music video with Lady Gaga for "The Edge of Glory". Clemons appeared in several movies and on television, making his screen debut in Martin Scorsese's 1977 musical, New York, New York in which he played a trumpet player. He played one of the 'Three Most Important People In The World' in the 1989 comedy film Bill and Ted's Excellent Adventure. In 1985, Clemons was a special guest star in Diff'rent Strokes episode "So You Want to Be a Rock Star", in which he played the role of Mr. Kingsley, a young saxophonist helping Arnold Jackson to learn to play his sax. He has also been a guest voice in an episode of The Simpsons. In 1990, he co-starred in the pilot episode of Human Target, a Rick Springfield action series intended for ABC. He also played the role of Jack in Swing starring opposite Lisa Stansfield and Hugo Speer, directed by Nick Mead. He appeared alongside Michael McKean and David Bowe as a miner in one episode of musician "Weird Al" Yankovic's children's television show The Weird Al Show. He made a cameo appearance in 1999's sequel to Blues Brothers, Blues Brothers 2000 as part of the metal section of super blues band The Louisiana Gator Boys. He appeared in the episode Michael's band of Damon Wayans' television show, My Wife And Kids as a musician and performed an original composition, co written with bassist, Lynn Woolever, called "One Shadow In The Sun". Clemons twice appeared as a Baltimore youth-program organizer in HBO's crime drama The Wire. He appeared in an episode of Brothers and in the "Eddie's Book" episode of 'Til Death as himself. Clemons was married five times. He had four boys: Clarence "Nick" Clemons III, Charles, Christopher, and Jarod. Clemons was a strong advocate and supporter of Home Safe, a non-profit organization helping victims of child abuse and domestic violence. Each year, Home Safe serves more than 15,000 infants, children and families in south Florida. From 2005 until his death, Clemons hosted an annual charity event for Home Safe called The Classic Rock & Roll Party. Through these events, Clemons helped raise over $2.5 million for Home Safe. In addition to raising funds for Home Safe programs, Clemons would also personally visit abused children at Home Safe's campuses to give them words of encouragement and practical advice about life. Clemons's monumental efforts on behalf of Home Safe earned him the President's Volunteer Service Award in 2010. On October 22, 2009, Little Kids Rock, a nonprofit dedicated to restoring and revitalizing music education in public schools, presented Clemons with the inaugural "Big Man of the Year Award" at the Right to Rock charity benefit. He helped raise money to put musical instruments and curriculum into underfunded public schools across the country. He also performed "Jailhouse Rock" with a student band from the Bronx, in addition to a number with legendary producer, John Colby. Clemons suffered a stroke on June 12, 2011. He underwent two surgeries after which he was declared in serious but stable condition. According to Rolling Stone magazine, he had been showing signs of recovery. However, Clemons died from complications caused by the stroke on June 18, 2011. Upon announcement of Clemons' death, New Jersey Governor Chris Christie ordered all state flags to be lowered to half staff in his honor. Bruce Springsteen said of Clemons: "Clarence lived a wonderful life. He carried within him a love of people that made them love him. He created a wondrous and extended family. He loved the saxophone, loved our fans and gave everything he had every night he stepped on stage. His loss is immeasurable and we are honored and thankful to have known him and had the opportunity to stand beside him for nearly forty years. He was my great friend, my partner, and with Clarence at my side, my band and I were able to tell a story far deeper than those simply contained in our music. His life, his memory, and his love will live on in that story and in our band." At their concert in Portsmouth, Virginia, on Sunday, June 19, 2011, Phish covered "Thunder Road" as a tribute to Clemons. At an Eddie Vedder concert in Hartford, Connecticut on Saturday, June 18, 2011, Eddie wished Clemons well, and shortly thereafter was notified by a sound tech that he had died. Vedder later played a tribute to Clarence during Pearl Jam song "Better Man" changing the lyrics to include, "Can't find a Bigger Man" (paying homage to Clarence's nickname "The Big Man"). During a subsequent performance on the Late Show with David Letterman, Vedder played a ukulele with "Clarence" written across the front of it. Before singing "Moment of Surrender" at the U2 concert in Anaheim on Saturday, June 18, 2011, Bono paid tribute to Clemons, who had died earlier that day. Bono read lyrics from Springsteen's "Jungleland" near the end of the song, and he repeated them at the song's conclusion. Bono repeated this dedication and tribute during "Moment of Surrender" at the U2 concert in New Jersey on Tuesday, June 21, 2011 and again in Baltimore on Wednesday, June 22. New Jersey rock band Bon Jovi performed "Tenth Avenue Freeze-Out" as the first encore during their concert in Horsens, Denmark on June 19, 2011. While playing that song photos of Clemons were shown on the giant video screen behind the band. Jimmy Buffett added verses that included Clemons in "The Stories We Can Tell" during his final encore during his concert in June 21, 2011. The rest of the band left the stage and it was Buffett playing and singing alone. During their set at the 2011 Glastonbury Festival, Brian Fallon, lead singer of the New Jersey rock band, The Gaslight Anthem dedicated their song, "The '59 Sound" to Clemons' memory. Additionally, shows on this leg of their tour began with a recording of Clemons' solo in "Jungleland" while the house lights went down. During Southside Johnny's annual July 4 weekend concert at the Stone Pony in Asbury Park, New Jersey, he and Steven Van Zandt spoke of Clemons. Afterwards, Eddie Manion played Clemons' famous "Jungleland" solo while a projector screened showed images of Clemons. 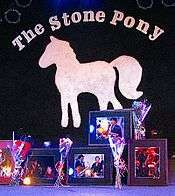 On July 17, 2011, a tribute concert was held at the Wonder Bar in Asbury Park, New Jersey. Bruce Springsteen performed a 45-minute set playing some of Clemons' songs. Clarence's son (Clarence III), who goes by Nick, opened the show with his band, The Nick Clemons Band. On October 1, 2011, a tribute to Clemons took place at the Seminole Hard Rock Hotel and Casino in Hollywood, Florida. Traditionally an annual charity event hosted by Clemons, called The Classic Rock & Roll Party, the event paid tribute to Clemons' life and all he did for Home Safe, a non-profit organization helping victims of child abuse and domestic violence. In January 2012, Clemons' hometown of Norfolk, Virginia paid tribute with memorial concerts, featuring members of the E Street Band. The concert took place at The NorVa concert hall. In the week that marked a year anniversary of his passing, pop star Lady Gaga dedicated her performances of "The Edge of Glory" to Clemons during her Australian stint of the Born This Way Ball. She was noted in saying that the day he passed was also the day he first watched the film clip for The Edge of Glory. She was also noted in saying that a day doesn't go by that she doesn't think about him and that she misses him so much. On July 28, 2012, in Gothenburg, Sweden, Springsteen and the E Street Band performed "Jungleland" for the first time on the Wrecking Ball Tour, with Clemons' nephew Jake Clemons playing the saxophone solo and the song being dedicated to Clemons. ↑ Rashod Ollison (2011-06-20). "Clarence Clemons: A big man by every definition | Entertainment | pilotonline.com". Hamptonroads.com. Retrieved 2015-12-19. ↑ Archived February 14, 2009, at the Wayback Machine. 1 2 3 4 Ben Sisario (June 18, 2011). "Clarence Clemons, Springsteen's Soulful Sideman, Dies at 69". The New York Times, A24. Retrieved July 1, 2011. 1 2 Jon Pareles (June 19, 2011). "The Big Man, Much More Than Springsteen's Sideman". The New York Times, C1. Retrieved July 1, 2011. ↑ Gary Graff (2009-10-15). "Clarence Clemons Tells Springsteen Tales in 'Big Man' Book". Billboard. Retrieved 2015-12-19. ↑ "The Virginian-Pilot Archives". Nl.newsbank.com. Retrieved 2015-12-19. ↑ Sisario, Ben (June 18, 2011). "Clarence Clemons, E Street Band Saxophonist, Dies at 69". The New York Times. ↑ Archived March 2, 2013, at the Wayback Machine. ↑ Archived February 19, 2012, at the Wayback Machine. ↑ Marsh, Dave (1981). Born to Run: The Bruce Springsteen Story. p. 277. ISBN 0-440-10694-X. ↑ "UMES ANNOUNCES 2012 ATHLETIC HALL OF FAME CLASS - University of Maryland Eastern Shore Official Athletic Site". Umeshawks.com. Retrieved 2015-12-19. ↑ "Truth & Soul, Digging in Music History". Twangville.com. 2008-06-13. Retrieved 2015-12-19. ↑ "Brucebase - 1970". Brucebase.wikispaces.com. Retrieved 2015-12-19. ↑ "Stormin' Norman Seldin". Normanseldin.com. Retrieved 2015-12-19. ↑ "Land Of Hope And Dreams". Hopeanddreams.free.fr. Retrieved 2015-12-19. ↑ "Locals Only!!! – The Motifs – If I Gave You Love | Iron Leg". Ironleg.wordpress.com. 2007-07-08. Retrieved 2015-12-19. ↑ Archived August 24, 2014, at the Wayback Machine. ↑ "Garry's Corner, The tribute page to Garry W. Tallent". Perso.wanadoo.es. Retrieved 2015-12-19. ↑ "Brucebase - Greetings From Asbury Park - Studio Sessions". Brucebase.wikispaces.com. Retrieved 2015-12-19. ↑ "Biography". Bigmanclemons.com. 1942-01-11. Retrieved 2015-12-19. ↑ Andy Greene (February 18, 2011). "Exclusive: How E Street Band Saxophonist Clarence Clemons Ended Up on Lady Gaga's New Album". Rolling Stone. Retrieved May 14, 2011. ↑ "Clemons looks for new Boss". Star-News. July 8, 1990. p. 2D. ↑ ""The Wire" Moral Midgetry (2004) : Full cast and crew". IMDb.com. Retrieved 2015-12-19. ↑ ""The Wire" Hamsterdam (2004) : Full cast and crew". IMDb.com. Retrieved 2015-12-19. ↑ "Clarence Clemons Suffers From A Stroke « 104.3 K-Hits Chicago". Khitschicago.radio.com. Retrieved 2015-12-19. ↑ Andy Greene (June 13, 2011). "Clarence Clemons Reportedly Showing Signs of Recovery". Rolling Stone. Retrieved June 20, 2011. ↑ Greene, Andy (June 18, 2011). "E Street Band's Clarence Clemons Dies at 69". Rolling Stone. Retrieved June 18, 2011. ↑ Archived June 25, 2011, at the Wayback Machine. ↑ "Clarence Clemons". Telegraph. Retrieved 2015-12-19. ↑ Gibson, Ginger (June 21, 2011). "Christie orders flags in N.J. be flown at half-staff following death of Springsteen saxophonist Clarence Clemons". New Jersey Online. Advance Digital. Retrieved June 22, 2011. ↑ "Bruce Springsteen's Statement on Clarence Clemons Passing: 'Loss is Immeasurable'". Billboard.biz. Retrieved June 20, 2011. ↑ "June 19, 2011 Setlist". Phish.net. Retrieved 2015-12-19. 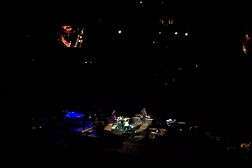 ↑ "U2 Pays Tribute To Clarence Clemons, Who Died Saturday At 69 « 104.3 K-Hits Chicago". Khitschicago.radio.com. 2011-06-20. Retrieved 2015-12-19. ↑ McCall, Tris. "U2 pays tribute to Clarence Clemons at massive New Meadowlands show". New Jersey On-Line LLC. Retrieved 19 April 2015. ↑ "Midnight Sun: Review: U2 at M&T Bank Stadium June 22 - Nightlife: Baltimore's music, bars, clubs, events and night scene from Erik Maza". Weblogs.baltimoresun.com. 2011-06-23. Retrieved 2015-12-19. ↑ Jay Lustig. "Clarence Clemons' death provokes music world response, tributes". NJ.com. Retrieved 2015-12-19. 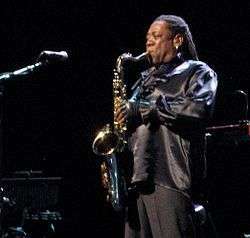 ↑ "Stars pay tribute to Clarence Clemons – The Marquee Blog". CNN. June 20, 2011. ↑ "BBC Glastonbury Festival - 2011 - The Gaslight Anthem". Bbc.co.uk. 2011-06-26. Retrieved 2015-12-19. ↑ "Entertainment and Guides for Hampton Roads, Va". HamptonRoads.com. Archived from the original on November 29, 2012. Retrieved 2015-12-19. ↑ "Clarence Clemons : Unofficial website: TV/Filmography". Bigmanclemons.com. Retrieved 2015-12-19. "Bruce Springsteen's Eulogy for Clarence Clemons". Rolling Stone. June 29, 2011.